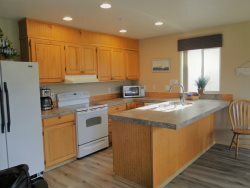 This newer home is Ocean Front in Ocean Shores on Agate beach. Come sit back and relax and enjoy the outrageous ocean views. All homes do require the first night plus tax for deposit. This deposit is non-refundable. If you cancel, this deposit IS NOT returned. There is a 2 night minimum stay, 3 nights during the holidays. All homes have a cleaning fee. There is a 2 car limit at this home. You must be at least 25 yrs. old to rent one of our properties. Sleeps 4 1 Bedroom /1 Bath Bedroom has queen bed, living room has a pull out sofa Full Kitchen TV / DVD Player Cable TV Wireless Internet Ocean Front Smoking is strictly prohibited. One small dog 20 pounds or under. Love the view, the house is great! They are always very friendly and nice which we appreciate! We've stayed many times at the casa de playa and never want to leave, we will be back. The only thing we have a little difficulty with is how small the bed is, maybe one day when we check in there will be a bigger bed. all went easily. lovely place, clean. friendly reception. wonderful little intimate place to spend a few days. very quiet and restful. walks along the beach. jogging to pacific shore. beautiful views. deer around house. Staff was very responsive and friendly. House was lovely. We especially enjoyed sitting on the deck and the beautiful view. Hope to come back soon! The property was lovely and clean. Kitchen and bath were was stocked with necessary items. Beds comfortable. Views and proximity to the beach were perfect. Thanks so much for allowing us to stay! Perfectly clean! Amazing location! Ill never forget that sunset! Very clean. The lady who helped check us in was very nice. Easy and simple! Just what we wanted. My girls and I had a great time. Nice little house all updated and very comfortable. Love the trails through the beach grass to the secluded beach. There is something about my kid jumping up and down yelling this is great! to know youve found a special little spot. The family of deer visiting was awesome too. Cant wait to come back!! The house was perfectly located on the beach and was everything we needed for a beach house. We loved it! The casa was wonderful, we look forward to staying there again! It was the perfect for our family. Cozy and comfortable, Amazing beach access. Check in was a breeze. Very nice people to stay with 5- stars. The property is awesome ocean view, beach access we're so nice. Very relaxing clean and just awesome.